For the novel I’m writing, I need a stem cell that can form inside the human body and rejeuvenate and heal characters. iPS cells, the ones I reported on last week, seem like they’ll work because a fictional gene might be plausibly able to re-program differentiated cells into stem cells inside a character’s body. But so far, the process hasn’t been tried in humans, the possibility of introducing dangerous genetic errors in lab-generated iPS cells is high. Yet there is one other type of stem cell that beckons me from a dark alley. 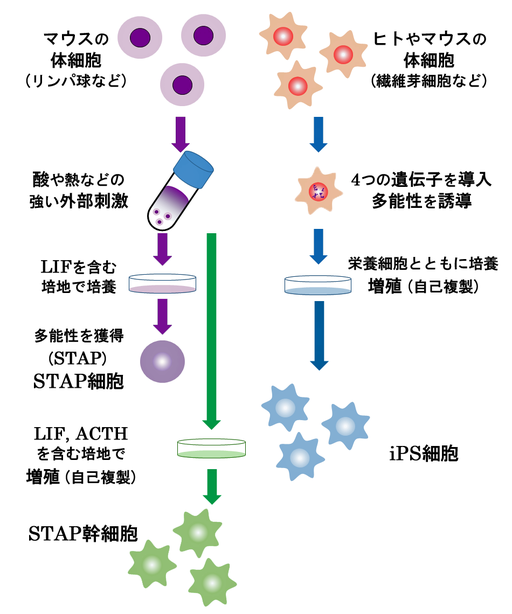 STAP cells. Those cells, if they even exist, are supposedly generated simply when stress is applied to them, no genetic intervention required. A study released in 2014 claimed differentiated cells had turned into stem cells after stress after a series of stresses had been applied. What could be more stressful than injuries that almost cause death and send the characters into suspended animation? But there is a danger in jumping on such a controversial cell in science fiction, STAP cell studies were retracted when their creation could not be could not be duplicated. Was the research published before it was fully understood? Will someone make them work later? Related to science fiction, if you use them in a novel, will you be just as discredited as the researchers who retracted their publications? One of them committed suicide. How accurate and plausible does sci-fi have to be for fans to accept it? Another name for science fiction is speculative fiction. Why not speculate wildly? It may come down to fans. I’m going to The World Science Fiction Convention next week and there are many writers workshops about creating believable space travel and planetary worlds. It makes me wonder how much speculation sci-fi/speculative fiction readers tolerate. A few weeks late on my comment, but the “speculative” stuff could be plausible until the STAP cell theory is totally proven wrong. It might be like writing a novel about Pons and Fleishmann’s cold fusion back in the early ’90’s. There was tons of interest back then and results were mixed, but still promising for a while. The subject matter could become dated, but that may not be a consideration worth worrying about. Thanks for the ideas uncle Mark. They are so cool. Interesting. I hadn’t heard of STAP cells. We almost decided to go to WorldCon because it’s so close this year, but Chris’ work is too busy right now 😦 I’m sad we’re going to miss it. I’m sad you’re missing it too. Let me know if you can make it for a day.